How to get from Nice to Monaco by public transport? What's the simplest and cheapest way to get from central Nice, France to Monaco by public transportation? 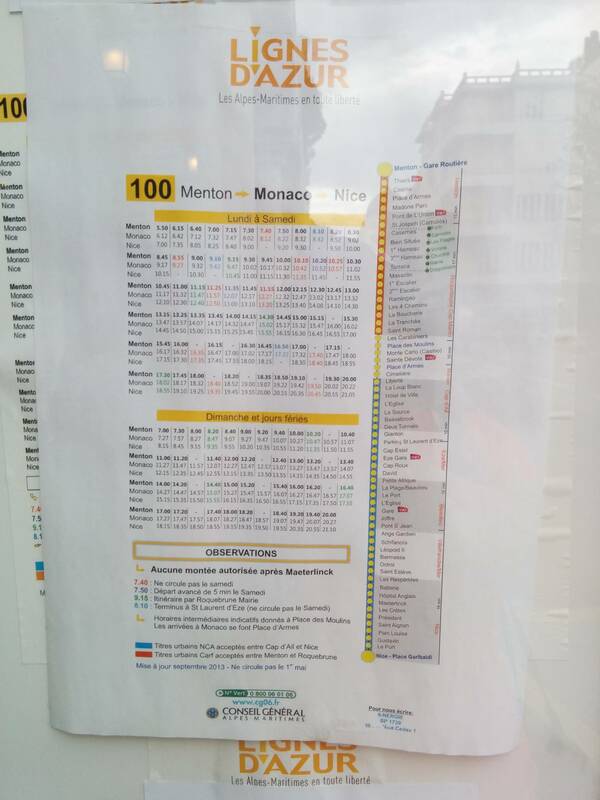 Bus 100 (Nice - Monaco - Menton) is a very good option and costs a mere 1.50 € (2015). It runs every 15 minutes mostly, and the trip takes 30-45 minutes. It takes an absolutely scenic route along the coast, passing through seaside towns such as Villefranche and Beaulieu. Cimetière, Place d'Armes, Stade Nautique, Office de Tourisme, Place des Moulins, Les Carabiniers. Les Carabiniers, Place des Moulins, Casino (Allée Lumière), Sainte Dévote, Place d'Armes, Cimetière. 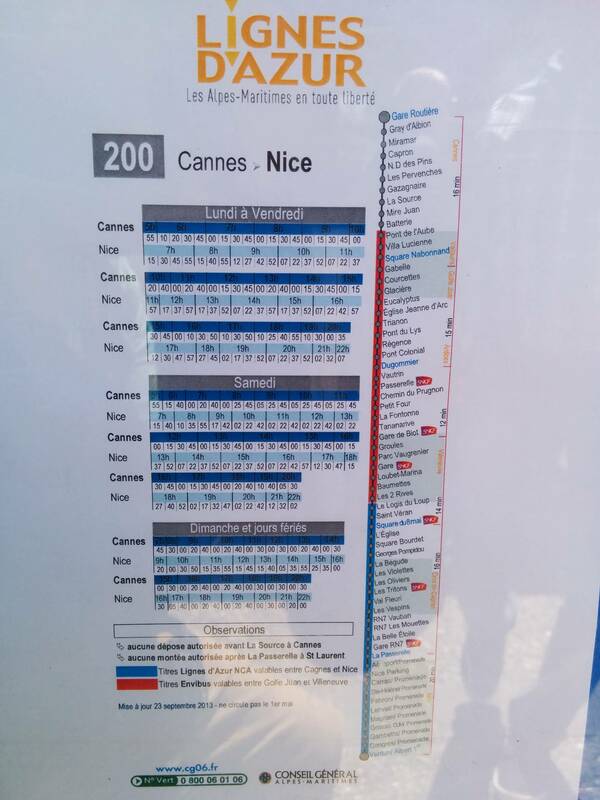 The buses don't run very late: last one from Nice leaves at 20:00, and from Monaco at 20:22. First departures in the morning are about 6:00. You'll find details and full list of stops in bus 100 timetable. Alternatively, take the train ("Nice Ville" to "Monaco Monte Carlo"). It is faster (22 mins) and arguably easier, but costs a little more at 3.90 €. There are about 2 regional trains per hour (daytime), according to SNCF. 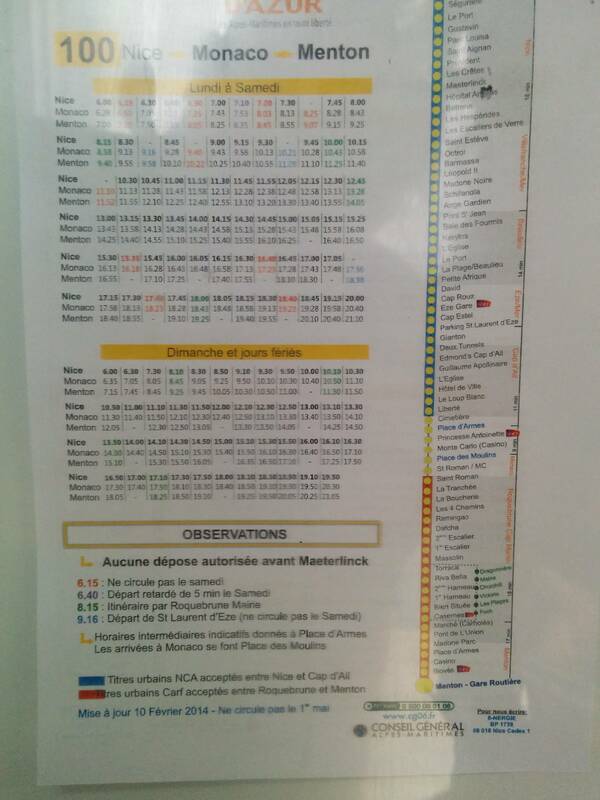 A good thing is that the trains run much later; last one leaves from Nice 22:25 and from Monaco 23:12 (on weekdays). The above applies to regional trains (TER) which would probably be your primary choice on this route, though you could also catch an intercity/TGV. I have just returned from Nice/Monte. Great trip and good advice given here. As of Nov 31 2013 the bus costs €1.50 each way and starts just off Garibaldi Square, pay cash. Also, the Nice day pass has changed. 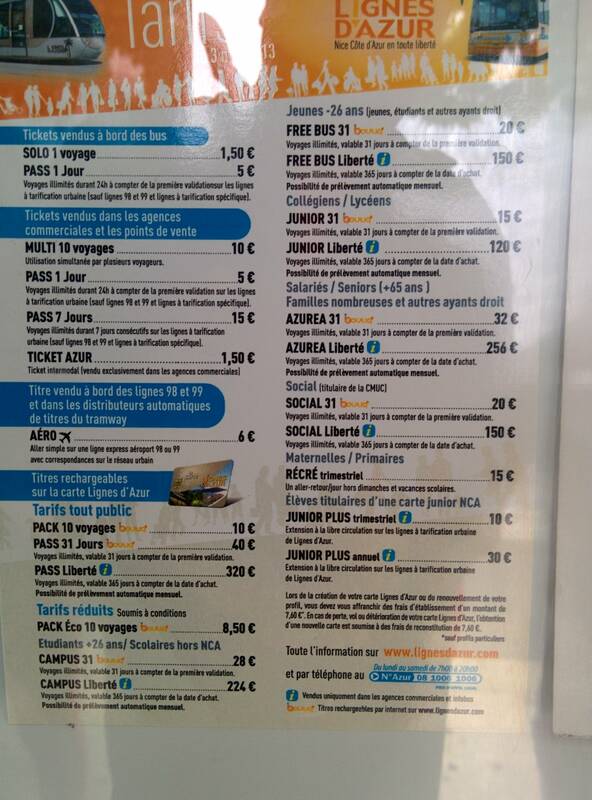 It is a 24 hour pass that costs €5 and can be used on all trams and buses in Nice except buses 98 and 99. What does this mean? The only bus that the pass covers that goes to and from the airport is the number 23 (catch it outside the Rail Station), takes 30-40 minutes to Terminal 1. From there use the free airport shuttle bus to get to T2. You ask, what about the 98 and 99 buses? Well they now cost €6 each way - the benefit is it is an express bus. The 100 bus to Monaco now leaves from the Promenades des Arts stop outside the Musée d'Art Moderne/Contemporain near the corner of Av. St. Sebastian and Traverse Garabaldi. Here are some of the Bus timetables that I got as of May 2014. I have just returned from Nice, Easter 2014. The 100 bus to Monaco now leaves from the Promenades des Arts stop outside the Musée d'Art Moderne/Contemporain near the corner of Av. St. Sebastian and Traverse Garabaldi. On arriving in Monaco we got off at Places D'Armes and walked up the pedestrian hill to the Prince Palace, then around to the Cathedral and past the Musée Oceanographique. To the east of the Oceanographic museum, there are steps down through the gardens leading to the port where you can get a Bateau bus across to the other side to get to Monte Carlo and the Casino. There's a short walk into the tunnel turning right off the port and you'll find an elevator around the corner to get up to the roadside on the southern end of the Hotel de Paris. I just returned from doing this day trip as well, great advice here! So as of January 2014, nothing has changed. The new bus stop to get the 100 is at the southeast corner of Garibaldi Square (or Place Garibaldi in French) on Rue Catherine Segurane. The best stop to get off and back on the 100 in Monaco is Places D'Armes. It's right next to the Place du Palais, and the Prince of Monaco Car Collection, Aka Top Car Collection. They have a dozen F1 race cars on display, and a myriad of cars from classic Ferrari's, Lamborghini's, BMW, to very old rare cars dating back to 1911. They even have some horse drawn buggies! There are no return tickets, one way only, 1.50 each way. Great little day trip, highly recommend it! SUMMARY of the information available on the link. Not the answer you're looking for? Browse other questions tagged public-transport france monaco nice french-riviera or ask your own question. How to get from Monaco to Nice by public transport? Visiting Monaco as an EU citizen — what to think about? Amsterdam: How to get from the Airport to the Hard Rock Cafe by public transport? Can you get from Nice Airport to near Gare de Nice Ville around midnight by public transport? 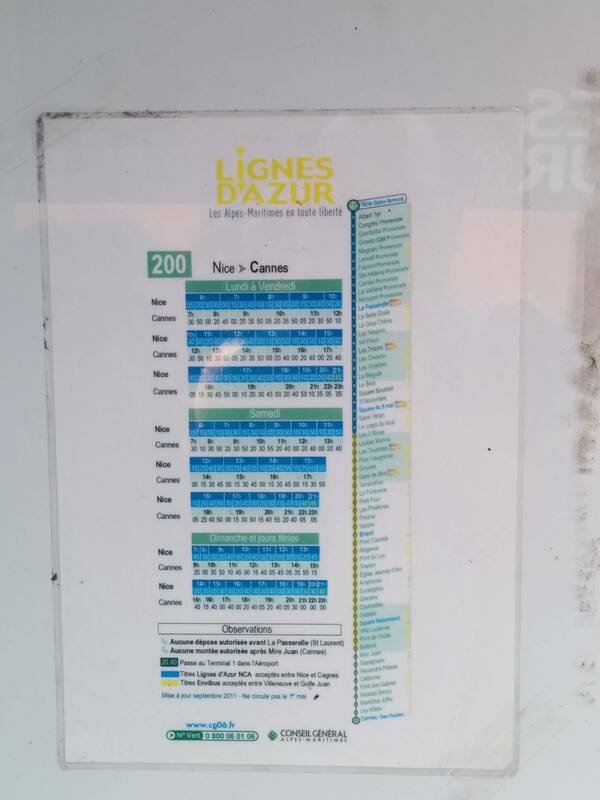 How do I get from Nice to Haut de Cagnes by public transport?